Make A Sew Easy Guide ‘Baby’ In 9 Seconds! 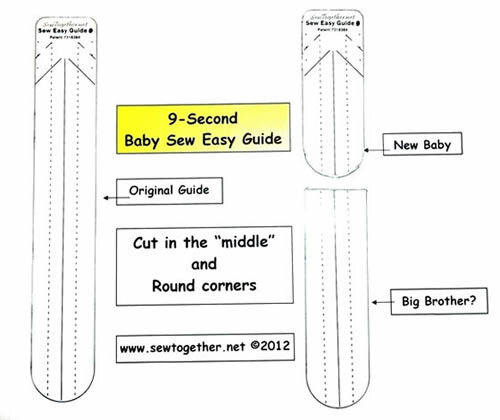 A Sew Easy “baby” is yours when you trim your Sew Easy Guide to a shorter length, and it only takes about 9 seconds (not 9 months!). If you are using the Sew Easy Guide for no-mark-no-paper half-square triangles, and your fabric squares are small (say 1.5″ or less), a baby guide will help you to maneuver the fabric squares more comfortably. If you use the Sew Easy Guide mostly or only as a scant 1/4″ seam guide, a baby guide will streamline the seaming process by removing the “excess length” that might be in your way. A baby guide is cute! Okay, so #3 is not a practical reason, but a baby guide is cute. See what Tiffiny of Smilie Mommy is saying about using her Sew Easy Guide as a seam guide and then check out the tips and pictures below on what to think about before you make a baby (hey, get your mind out of the gutter!). Realize that once you cut the guide shorter, you can’t make it long again (well, you could, but it would not be the same). Be sure to round off the end of the new guide to keep your fabric feeding smoothly under the guide (use the original guide to trace and cut the curve on the baby). Frugal tip alert: Make the part you cut off (the big brother–see below) into another guide if you have a hole punch and double stick tape OR use the big brother as a guide for hand-marking scant 1/4″ seamlines, etc. 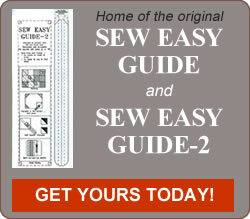 If you do not already have a Sew Easy Guide, or if you want a spare or two, get them from your favorite quilt notion store or order direct from us.